Partition-based clustering is the task of partitioning a dataset in a number of groups of examples, such that examples in each group are similar to each other. Many criteria for what constitutes a good clustering have been identified in the literature; furthermore, the use of additional constraints to find more useful clusterings has been proposed. In this chapter, it will be shown that most of these clustering tasks can be formalized using optimization criteria and constraints. 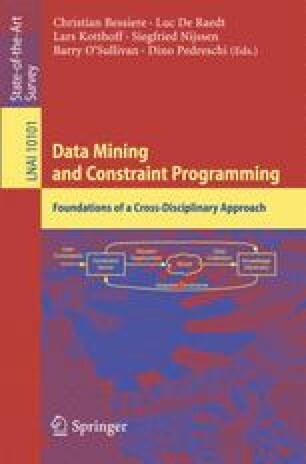 We demonstrate how a range of clustering tasks can be modelled in generic constraint programming languages with these constraints and optimization criteria. Using the constraint-based modeling approach we also relate the DBSCAN method for density-based clustering to the label propagation technique for community discovery. Siegfried Nijssen can currently be reached at the Institute of Information and Communication Technologies, Electronics and Applied Mathematics, UC Louvain, Belgium. Tias Guns can currently be reached at the Vrije Universiteit Brussel.